Romans was an epistle written by the apostle Paul before he stepped foot on Rome, having known about the situation of Rome from various Romans whom he had met along his missionary journeys. Rome had a delicate situation – for a number of years (around 49 – 54 AD) the Jews were exiled from Rome because of rioting instigated by a man called Christus. Upon the return of the Jews, the Roman Church, which was once purely-Gentile, became culturally awkward with the Gentiles having to accommodate with the sudden influx of Jews. As an epistle Romans is filled with theology, and Romans 12 touches on 3 main topics: Christian living, Gifts and Love. Today’s verse fall into that ‘love’ category. If we talk about great love passages in the Bible many will refer to 1 Corinthians 13, but I personally prefer the harsher Romans 12:9-21. We were told in 1 Corinthians 13:13 [Article] that the greatest of these is love – and the verse today speaks of the hardest type of love – how do we love the unlovely? How do we love our enemies? The next verse [Romans 12:15 | Article] tells us to rejoice with those who rejoice, mourn with those who mourn. Are we able to rejoice with our enemies and mourn with those who persecute us, genuinely? I was at my local GLS (Global Leadership Summit) couple of days ago when Condoleezza Rice, one of the speakers, brought up Nelson Mandela‘s vision. How could a black man, in a time when the whites were opposing the blacks, with a long world and local history of the whites oppressing the blacks, have a vision that is not the blacks oppressing the whites but a vision of multi-racial harmony? Another speaker, William Ury, mentioned Abraham Lincoln in an example during the American Civil war, when he was speaking sympathetically about the South in front of many Yankees as the President of America, somebody asked, how could you be sympathetic to our enemies? We ought to be talking about how to destroy them! Lincoln taught for a little and answered, Madam, do I not destroy my enemy by making them my friend? I was struck. Indeed, how could Mandela? In a time when society taught it was okay to be vindictive, an eye for an eye mentality was the norm, how could he have such a peaceful vision? Where does such peaceful sentiments come from? I’m not American, and I’m not white or black – it is usually hard for me to empathise for them. Even so, the two examples took my breath away. That peace came from God, that mentality of being friends with your enemies came from the Bible and not anywhere else. Revolutionary. Reactions depict what you do in the immediate aftermath of the persecution. Are you angry? If you are angry, do you defend yourself immediately and counterattack, verbally or physically? Do you curse at him before you even know it? Do you hate him with such a deep vengeance? Actions depict what you do later on. Plan a long-term revenge? Hold a lifelong grudge? 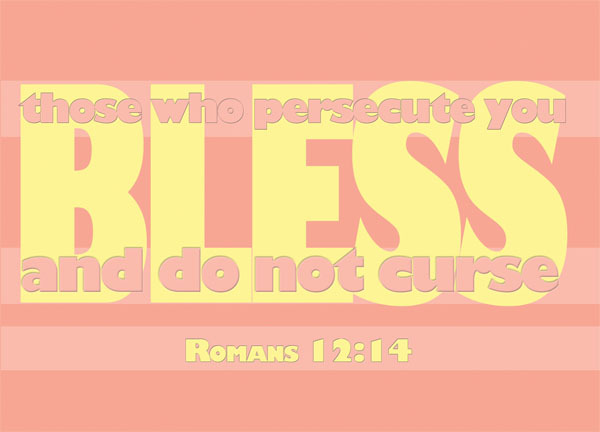 When persecuted, what should you react? What should you do? Turning the other cheek [Matthew 5:39] is a very familiar concept in the Christian faith – a call for us to not take revenge but instead suffer patiently a repetition of the same injury. It also suggests a very difficult attitude – that of forgiveness. When Peter asked how many time should he forgive a brother, Jesus answered, “I tell you, not seven times, but seventy-seven times.” [Matthew 18:22] (In some translations it’s 7×7 times). In Romans 12:14 we are told to do one more thing, and that is to bless those who persecute us. It may be one thing to stand and suffer, but it is another thing entirely to bless the other. How do you love your enemy? How do you love the unlovely? How do you rejoice with those who rejoice, even when they are enemies? Even as Paul tells Timothy about the brothers who had deserted him, he hoped that may it not be held against them [2 Tim 4:16]. Paul could be quoting from Jesus in Luke 6:28 – bless those who curse you, pray for those who mistreat you. Upon blessing them and wishing them well from the bottom of your heart, you still have to pray for them. Famously, Jesus prayed for his persecutors while he was suffering on the cross [Luke 23:34]. And finally, of course, no ‘I hope he trips on his way back’ or ‘I hope his ideas get shot down’. Petty curses, or major ones – ‘I hope he get struck by lightning’ vindictive curses or acts of vengeance. From the Bible, let’s find out why we should bless our enemies. By calling yourself a Christian, by claiming to be a follower of Christ, it is your duty to act as Christ did, to bless your enemies as he did. You have to deny yourself, take up the cross daily and follow Jesus [Luke 9:23]. Things like this show us what it means to be a disciple. 2 Tim 4:17-18 – But the Lord stood at my side and gave me strength, so that through me the message might be fully proclaimed and all the Gentiles might hear it. And I was delivered from the lion’s mouth. The Lord will rescue me from every evil attack and will bring me safely to his heavenly kingdom. Matthew 10:28 – Do not be afraid of those who kill the body but cannot kill the soul. In Christ we are assured of a future beyond the worldly life, and we are promised eternity with the Lord. Worldly injury, even if persistent and life-long, are but temporary – when your life ends, it is no more. A person can hurt you, but it has no bearings on you in the realm of the heavens. Hence, be gracious, rejoice in the Lord to the death of our worldly and bitter self, and embrace the joy that salvation brings, which enables us to forgive our enemies. Identify your enemies. You may already know clearly who are your enemies. They could be persecutors, prosecutors, people who hate you. They could be family, friends, and even brothers-in-Christ. But there are times when our natural defence mechanism kicks in and we avoid and ignore people who persecute us that we don’t really see them as our enemies. They are. When we ignore them, and there will be no conflicts, no pain, and great peace. Yet it is but just a worldly peace, a peace that does not transcend all understanding. We can ignore them, but the better situation for us is to face them, bless them, forgive them and pray for them. Why settle for less when we can better ourselves? Let us pray for ourselves. Pray for the peace that transcends all understanding in our hearts [Phil 4:7]. The world never taught us how to love the unlovely. How do you love a Judas in your life, who betrayed you for money? How do you bless Pilate, or the Jews who are going to cause your death? How do you love those who have hurt you again and again, rejected you again and again; disobeyed you again and again? The world doesn’t know how. But God is love, and God knows how, as demonstrated by Jesus, and by the followers of Christ that come before us, like Paul, like Lincoln, like Mandela. They have blessed their enemies. What about us? God bless you Z for posting this beautiful teaching on blessing those who curse us. It is a much needed lesson that we all need to take to heart and ponder and OBEY. Thank you for being obedient to Holy Spirit and breaking it down for everyone. I received that lesson.